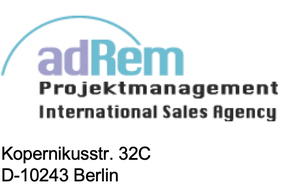 adRem Projektmanagement offers professional country-, industry-, and company-analyses. In addition to BCG, SWOT, and SKU-analyses, we apply methods that have been specially developed for companies oriented to professional endusers, and that were successfully applied in numerous projects. Clearly, we do not only define strategic goals. We also develop well tuned project-roadmaps and assist you in implementing them. If your company needs to form alliances, co-operate with or acquire other companies in order to reach its goals, we are again well prepared to help, thanks to our international experience and networks.